The MOST RECENT (20TH APRIL) of a series of increasingly worried – but more realistic – reports seems that the great myth about Sai Baba living into his 90s, as he has predicted – so “I can finish My Task” is about to be blown apart. Tuesday health status. 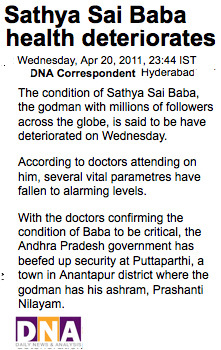 Satya Sai Baba who is undergoing treatment at Sathya Sai Super Speciality Hospital at Puttaparthi in Anantapur district remains in critical stage. The doctors who are attending on him expressed their worries about his slow response to treatment. Baba is still remains only on the supporting system. His vital organs like lungs and liver are showing only a slow response to treatment. The medical bulletin issued on Tuesday says. A.N.Safya, the director of SSSSH said that Baba is still under support of ventilator and continuous renal replacement therapy of dialysis. The health statement added that Baba’s blood pressure is not constant and it is normalized by administering suitable medicines. Doctors are in vigil in attending him round the clock. The medical bulletin did not mention anywhere about his health as stable and which worries his thousands and thousands of devotees. Sathya Sai Baba is 85 years old and he was admitted to the hospital on March 28th and he entered the 23rd day of his treatment. I pointed out over a day before this announcement that the reports that Sai Baba’s condition was stable were belied by the other information given… and now at last his medical minders have left out this very word! They are slowly learning, step by step… while anyone with an analytic capacity can see their confusion and how they express themselves contradictorily, all being ‘devotees of Sathya Sai Baba’! One thing they cannot do is rid themselves of the long and deep indoctrination that his supposed miracles induced in them – never tested by independent observers or scientifically proven, of course, but often proved to be sleight-of-hand and mere rumours spread on purpose to enhance his self-claimed ‘inscrutable mystery’. It is no mystery to people who are experienced in these matters and who can see what his medical condition indicates… just as with any other aged and strongly-handicapped person who gets the same multiple organ dysfunctions over such a long period. LATEST REPORTS (Apl 20th) THE END IS NIGH? The latest of a series of increasingly worried – but more realistic – reports seems that the great myth about Sai Baba living into his 90s, as he has predicted – so “I can finish My Task” is about to be blown apart. 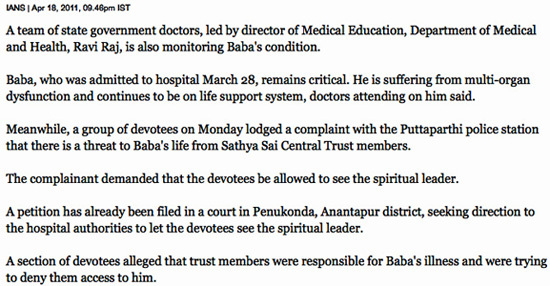 “His vital systems including liver are showing minimal response to treatment, which is a cause of worry to the treating doctors,” a medical bulletin issued this morning by the Sathya Sai Institute of Higher Medical Sciences said. “I read this in a Telugu newspaper – Dr Safaya stated that without Sathyajit, treatment cannot take place as he is “close” to SB and therefore, has been allowed inside the ICU. Apparently, SB “likes” him a lot and Sathyajit is the only one who can decipher SB’s “body language”. This means Sathyajit has been allowed inside the ICU from day one. In a startling development, devotees in Puttaparthi have lodged a complaint with the police there that the Sathya Sai Central Trust is a threat to the life of Sathya Sai Baba! Do they not know that the Puttaparthi police have long been entirely bought out and entrapped by the Central Trust? Obviously they have not hitherto wanted to ‘see, hear or speak ill’ as SB tells all to do (so simplistically and against all natural human and pressing social needs to reveal wrongdoing). But they are speaking up now, and some! Donations to Sathya Sai Central Trust misused by/for directors etc. Five cars given to fat cat officials by Sai Baba from Sai Central Trust funds, where at least two of them are directors! So, where this fact is covered up – or lied about – one can fairly suspect that there are others. 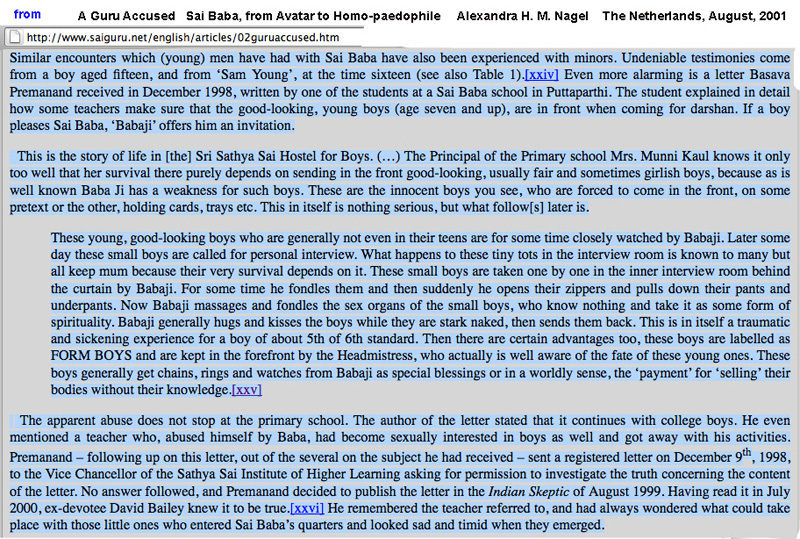 Sathya Sai Baba’s official journal editor, now deceased V.K. Narasimhan, knew of considerably corruption and embezzlement in the Sathya Sai Central Trust, about which he informed me privately on several occasions, not least when I asked him about how best to ensure that my donations of a book I wrote best could be ensured would go to the intended beneficiaries. See here also The very heavy burden I inherited. What kind of service do his closest students or “form boys” provide? There are diverse kinds, as most of his close assistants have known for decades. Take Isaac Tigrett, for example, the Hard Rock ‘beefburger king’ and top Sai dog devotee and confounded mystic, who confirmed he believes that Sai Baba sexual abuse allegations are true – on the BBC film ‘The Secret Swami’!